The crazy guys at Google are extending their business to renewable energy. Investing a solid $ 100 million in what is to be the world’s largest wind farm. When fully operational in 2012, Shepherds Flat Wind Farm is to produce 845 MW of energy, an estimated 2 billion kW·h a year. The project includes 338 GE2.5XL onshore wind turbines each with a capacity to produce 2.5 megawatts. Built by GE Wind Energy, a subsidiary of General Electric. “This project is exciting to us not only because of its size and scale, but also because it uses advanced technology. This will be the first commercial wind farm in the U.S. to deploy, at scale, turbines that use permanent magnet generators—tech-speak for evolutionary turbine technology that will improve efficiency, reliability and grid connection capabilities. Though the technology has been installed outside the U.S., it’s an important, incremental step in lowering the cost of wind energy over the long term in the U.S”. Writes Rick Needham, Director of Green Business Operations at Google on googleblog. It’s a good thing the creative minds of Google are bend on renewable energy. There is a lot of talk amongst skeptics saying it’s impossible for renewable energy to meet humanity’s demand for power. As impossible, perhaps, as it seemed in 1995 to entirely index the ever-expanding web in order to get better search results. “We’re excited about helping deliver clean energy to the grid and we hope this latest investment encourages other companies to think about ways they can help accelerate the deployment of more renewable energy. We remain on the lookout for more projects that make business sense and will help all of us take advantage of clean, renewable energy”, writes Needham. 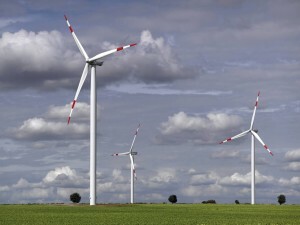 To have those run exclusively on wind energy, would be a step towards shepherding the wind to power the digital world.